They have been highly disruptive and, unsurprisingly given their common clothing of choice, highly visible across France. Their movement grew from anger at hikes in car fuel taxes, and with driver discontent at its heart, demonstrators adopted a name and an attire associated with every car in the country - the yellow vest or "gilet jaune" - a mandatory safety requirement in all French vehicles. However, the protests quickly morphed into a wider movement of frustration at high taxes and living costs and mounting public dissatisfaction with President Emmanuel Macron. The so-called "yellow vest" protests have seen hundreds of thousands taking to the streets, mounting roadblocks and making their presence felt on motorways and in towns and cities across France. Since the first protests on 17 November, many of these mobilisations have passed off peacefully. However, there have been sometimes violent confrontations, with motorists frustrated at traffic disruption as well as police. Two people died and more than 600 were injured in the first two weeks of protests. Paris witnessed some of the most violent clashes. On the second Saturday of protests, riot police fired tear gas and water cannon at some of the 5,000 "yellow vest" protesters gathered on the Champs-Élysées, while a number of demonstrators could be seen throwing paving stones and barricades. What is new about the "yellow vests" is that this movement has been largely organised via social media, with no clear leader, structure or affiliation. Facebook posts complaining about hikes in car fuel taxes effectively snowballed into street protests. This stands in sharp contrast with mass French protests of the past, which were usually managed by a trade union, political party or particular interest group. However, there have been efforts to introduce some kind of leadership structure to the movement and to set out its goals. An eight member negotiating committee was appointed for example, but almost immediately, some within the movement refused to recognise its legitimacy. Unusual too is the way in which this movement spans the political spectrum, from the far-left to the far-right, and in the middle, frustrated commuters and even former supporters of an increasingly unpopular French president. From the beginning "yellow vests" secured broad public support. Before the first road was blocked, one survey found 73% approved of the impending protests. A week and a half in, after widespread disruption and some violent scenes, another survey put support at two out of three people. The government and police blamed far-right groups for the violent clashes witnessed in Paris on 24 September. However, the Macron administration has been cautioned against characterising the "yellow vests" as an "extremist movement". 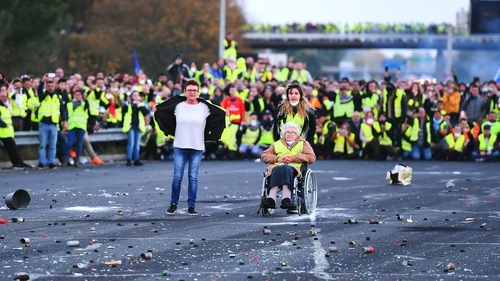 For example in a letter published on 27 November in L'Opinion, 12 of 13 presidents of France’s regional councils said such a move would be a "serious mistake" and that the protests were instead indicative of widespread anger. Spiralling fuel costs were undoubtedly the spark that ignited the "yellow vest" movement. In the past 12 months, the price of diesel, which is the most commonly used car fuel in France, rose by around 23%, while petrol increased by 15%. Over roughly the same period Irish motorists saw diesel prices go up by 15% and petrol by almost 10%. Consumers in both countries are now paying around the same at the pumps. The increases can in part be attributed to the rise in global oil prices this year, though these have fallen back again. In France they also coincided with hikes in carbon taxes on fuels as part of the government's effort to encourage drivers to switch to cleaner cars and fuels, 7.6 cents a litre on diesel, and 3.9 cents a litre on diesel. And the new year promises further fuel tax hikes in France, with diesel due to go up by 6.5 cents a litre, and petrol by 2.9 cents a litre, from January. Anger at these hikes is being felt most keenly by those living outside of big cities well served by public transport; those living in villages or commuter towns who are heavily reliant on their cars. In advance of the protests, Mr Macron had little sympathy for those calling on him to row back on January’s planned hikes. He said that "people complaining about rising fuel prices are the same ones who complain about pollution and how their children suffer". However, ten days after the first roadblocks went up, the French president used a speech on the country's future energy strategy to strike a more conciliatory tone. While critical of those he described as "rioters", Mr Macron said there were also "citizens who want to convey a message". "We should listen to the social alarm and protests, but there is also an environmental alarm," he added. The president did not bow to calls to reverse impending car fuel tax hikes, instead he suggested the controversial car fuel tax could be adjusted should oil prices go up, and pledged to carry out a three-month public consultation process on achieving a low-carbon economy without penalising low-income families. Where to next for the 'gilets jaunes'? The president's promises have done little to assuage the anger of "yellow vests" protesters and more demonstrations are planned. However, the longevity of this leaderless movement depends on whether it can maintain its momentum and avoid splitting into various factions, and if its popularity with the public will endure.